OVERVIEW: Sony Pictures Home Entertainment invites you to take a chilling journey between this world and the next in the supernatural thriller PASSENGERS, landing on DVD this May 12, 2009. Anne Hathaway (Golden Globe® nominee Rachel Getting Married, The Devil Wears Prada) and Patrick Wilson (Golden Globe® nominee TV’s “Angels in America”, Lakeview Terrace) lead a stellar cast in this suspenseful film about a young therapist (Hathaway) assigned to counsel the surviving passengers of a plane crash. When the survivors begin disappearing, however, her only hope for understanding their fate lies with the mysterious passenger (Wilson) most reluctant to open up to her. Viewers will be on the edge of their seats as this elegantly acted and cleverly told thriller reaches a shocking conclusion. PASSENGERS offers viewers a suspenseful journey into fear they’ll want to take again and again! SYNOPSIS: Best friends Emma (Anne Hathaway) and Liv (Kate Hudson) have always dreamed of being married at the Plaza Hotel in the month of June. Planning on wedding their respective husbands-to-be, everything seems to be going perfectly – the dates are set, their dresses are beautiful and the maids of honor – each other – are as joyful as can be. However, when the pair of friends receives the bad news that their weddings were planned for the same day, the pre-wedding bliss is ruined. With neither willing to give up her dream wedding, Liv and Emma declare themselves to be engaged in the most heated and dangerous kind of war known to man: The Passengers. DVD: Passengers is presented in a widescreen format with a 2.40:1 aspect ration. The transfer looks clean. The picture is complemented with a 5.1 Dolby digital sound in English and French with Spanish, French and English subtitles. 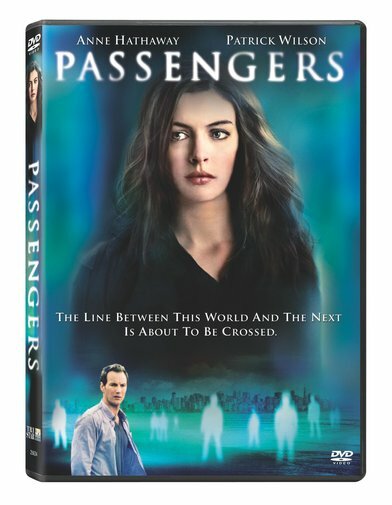 In terms of special features PASSENGERS arrives with thrilling bonus features, including deleted scenes, a making-of-featurette, a featurette profiling the action sequences, and a revealing audio commentary with director Rodrigo Garcia and star Patrick Wilson. English and French 5.1 (Dolby Digital).